I'll start with the health bit, it seems more logical, at least to me. 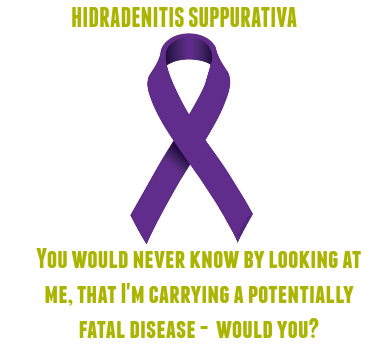 I've briefly mentioned before that I have a condition called Hidradenitis Suppurativa - known to many as HS for short, its a chronic skin disease that I'll have for life, and along with my psoriasis it's another autoimmune disease that I'll live with forever, there's no cures for either, only treatments that can sometimes, yes sometimes - help the conditions. Both are apparently more likely to flare up with stress, so you're advised to avoid stress, HA, if only it was that easy. My HS story started many years ago, but last year around February 2016, I'd noticed my HS was spreading. Still located in my armpit, it wasn't spreading across my body thankfully, but along with the spread come more pain, more agony and more sleepless nights. My sister got married last June, and I was a bridesmaid for her, and because of this stupid condition, she had to add a shawl to her bridesmaids dresses just to help me cover my armpit, something I'm forever grateful for - because if psoriasis didn't take away the last bit of confidence I had left, HS sure did! Around two months before my sisters wedding, I remember visiting my GP to talk about what was going on under my arms, I'd already self diagnosed myself with HS and was 100% sure it was what I suspected - HS, although my doctor couldn't confirm herself as she's not a dermatologist, she too was pretty certain that HS was what I had. A referral was made to the dermatology department at my local hospital, and I was given a course of antibiotics to take in the meantime to see if they'd help with any infection that may be going on. Fast forward to February 2017 - last month, and my HS was at its worse. I wasn't sleeping properly, I couldn't eat properly because the pain just made me feel sick and aggy, the littlest touch to my arm would set me off and I'd find myself in the bathroom, crying silently wishing I had the guts to chop my arm off. I tried every natural and home made remedy out there, I got another course of antibiotics and paracetamol became my best friend - not that it even touched the pain mind you. Having enough one night, well around 2am in the morning, I begged Gareth to help me, I wasn't brave enough to do it myself so I needed someone to help me. I needed the pressure to go, I wanted the pain to stop, so I asked if he could get me a steralised needle for us to pop the abscesses that was causing me so much grief - the pain, the PAIN was unbearable, so as soon as the needle to touched the abscess I quickly moved away. We tried again, tears flowing down my face faster than the tissue could catch them, all for nothing, as nothing was coming out. Gareth at his wits end, not being able to see me like this suggested he cut it with a razor blade, by this point I was in so much pain I couldn't care less, so whilst he got a brand new blade and sterilised it, I got myself a cushion to bite into and made myself as comfortable as I could. Gareth come back upstairs to my bed and asked if I was ready? I was ready to be pain free (if only!) and ready for a full night's sleep, but panic spread over me, are we doing the right thing? Is this safe? Will I make matters worse? What if it made me jump and Gareth accidentally catches me in a different place? I told him my fears, and sobbed on his chest whilst another hot flannel was placed under my arm. You forget what it feels like to have your arm in its natural resting place when you've had to hold it away from your body for so long. You forget what your mood was like before the agonising pain, and you forget what sleep is. You forget what your natural body smell is, because now you stink of rotting flesh. You forget what its like to be able to sit down properly, because even that hurts if you accidentally knock your arm, you can't get in and out of the bath without help, because the pain is so unbearable, the tiniest bit of weight hurts, really hurts. I've only had one child but I'd have 10 in a row over this pain any day. Last week, after a month of not sleeping, eating and resting properly, I decided at 4:20am that I was taking myself to A&E once little man was at school. Enough was enough and after waiting over a year for a dermatologist appointment, I needed help. I knew if I went to my doctors they'd only be able to give me antibiotics, which sadly didn't help the two times I'd had them, and whilst I didn't want to give the NHS more work, I had to do it. When walking into the A&E department, with no bra on (because believe me, even having your naked skin hurts!) I faced a room full of people, each with different accidents and emergencies, all needed to be seen, and I could only imagine how long I'd be waiting for. I don't know exactly what I went there for, when you've not slept properly for over a month, and you're in agonising pain, I suppose you just think they'd be able to take it all away, give you some quick fix, you're in dreamworld, but its the only thing you can think of to see you through. I was called into the assessment room within five minutes of me being there, this is something our local A&E does for everyone to determine how quickly you're going to be seen, I showed the nurse my arm, warning her before so to block her nose from the horrid smell, and told her how I've not been eating, sleeping or even living normally, she wasn't surprised. I told her what I suspected it was (HS) but also said that it wasn't confirmed and I was still waiting to see a dermatologist. The nurse had never heard of the condition herself and both of us proceeded to Google for help with the spelling. Once she'd updated the computer, she took my blood pressure and temperature and told me to go back to the waiting room and wait to be seen, only not even five minutes back in the waiting room, I was called into the main A&E department. I was told instantly that they wanted an ECG (electrocardiogram) and blood test. 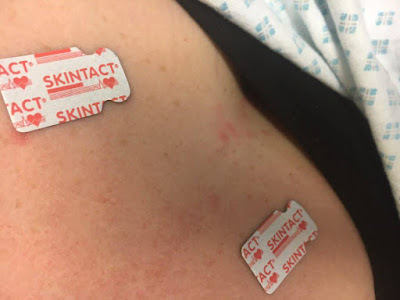 I was told to lay on a bed and a nurse then stuck sticky tab things all over my body, connecting them to wires. She then went off, got someone else and come back and said they was going to transport me to a different part of A&E, the major department, she asked if I had anyone waiting for me in the waiting room as I wouldn't be going back through, I told her my cousin was with me and the next thing I know is I'm getting put on a different bed in the A&E department where the ambulance patients go. I was quickly set up with a cannula, and given antibiotics through it whilst I took paracetamol orally, I had other things put through the cannula but I couldn't tell you what they was, all I know is one of them went in really slow and made me feel sick, I was then given anti sickness medication also through the cannula and left on the bed with no one really telling me what was going on. I'd got there at about 9:30am, and it wasn't until my cousin asked a nurse just after 2pm what was going on that I was told I was being admitted, and that they was just waiting for the surgeons to come and see me - surgeons? As in surgeons who perform surgeries/operations. If my heart wasn't racing enough from the pain and anxiety, It sure had shot up then. I'm always there for when little man finishes school, I started to get upset thinking about Gareth collecting him, and him wondering where his mum was? 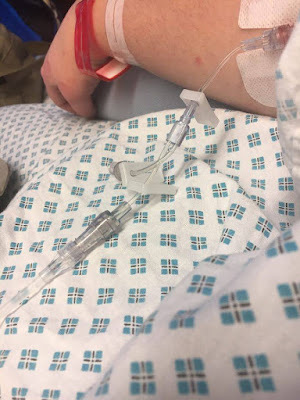 He's scared of hospitals himself, so I wasn't too keen on the idea of him knowing I was at hospital as I know he'd panic, he'd worry and with no direct and easy route to the hospital, he'd not be able to see me in a hurry. I was moved via a wheelchair by a lovely porter to the surgery ward, where thankfully I was kept in the know about what was going on. I do have HS and they needed to operate. As soon as I heard those words, I needed a cigarette, I'd been there for so long and by now it was around 4:30pm, I knew I wouldn't be able to go for a cigarette straight after surgery - heck I didn't even have a clue when I was being operated on, I just know I needed a cigarette, and politely asked if I could go for one. The doctor said they'd advise me not to, but they couldn't stop me. I didn't want one, I needed one, to calm my nerves at least. Whilst my cousin was amazing and I can't thank her enough, I didn't have my parents with me, or Gareth - the people I find most comfort in (and little man of course, but this wasn't an ideal situation) I could've easily smoked two cigarettes I was so stressed. When I got back to the ward, I noticed that my arm pit area was very wet, I pulled my gown to one side and looked to see an explosion, the one thing I wanted, hoped and prayed for - for months had finally happened. I was relieved, the instant pressure relief felt amazing, and whilst in comparison to the size of the abscesses the explosion was super tiny, it felt a little bit better. Due to the explosion, the doctor wasn't happy with operating, so called for his registra to have a look at me, he too wasn't happy for an operation, so advised the doctor to drain it out by hand, to which the doctor said should I local local anaesthetic, the surgeon advised against this informing me they'd have to give me at least six insertions, causing agonising pain which I was already in, I was advised to bite the bullet and have the procedure without the LA. I kid you not it was the worse pain of my life, the procedure lasted around 40 minutes and in that time I wasn't even offered gas and air, something I myself didn't think of until way after. Earlier I said I'd give birth to 10 babies in a row instead of having that pain. I'd now easily have 100 - that's how bad the pain was. Once the procedure was done, I looked forward to going home, only to be told my heart rate was too high and they couldn't let me home. My heart rate was something like 116 when it should've been 60 - I just wanted to get home, have a nice hot bath and cuddle up with my boys, I missed Spud terribly, the last time I saw him was at 8:30am when Gareth took him to school (even doing the school runs was unbearable due to the pain), I'd not even spoke to him on the phone because I knew if I heard his voice I would've broke down. They put my heart rate down to the fact I'd just had a extremely painful procedure with not an ounce of pain relief. Then my blood pressure dropped way too low. I thought I was going to be home for ages, if it wasn't one thing, there was something else. Then there was my blood test results from earlier on in the day, my white cells was extremely high, they wanted to keep me in on an antibiotic drip, whilst I just wanted to be at home, with my son and partner, I was even missing the dog even though he always accidentally bumps into my arm whilst climbing and jumping on me. Thankfully, with a sandwich my blood pressure started to climb and in time my heart rate dropped to 96. I was discharged from hospital with 30mg of codeine, antibiotics and dressing pads to clean and self drain the wounds. I'll end up having an operation one day, but for now it's just a case of waiting to see the dermatologist, self draining the abscesses myself and putting up with the pain, and hospital visit after hospital visit. The hospital was amazing and said I'd done the right thing by coming in, they was just surprised that they'd not seen me sooner, believe me the thought popped into my head so many times, its just when do you know when its right to go to A&E? We're constantly seeing how much pressure the NHS is under, and I didn't want to put anymore stress on an already overstressed service. I'm very thankful for all the staff who work for the National Health Service, because today although I'm still in pain, it's not so unbearable, it's not leaving me crying throughout the day and night, and I'm getting a good 5-6 hours sleep a night. I come to facts with my psoriasis a long time ago, I knew it was forever and there's no cure. I'm not at that understanding stage with HS, but what I do know, is I hate it - I wouldn't wish it on anyone else, and I hope and pray that one day, HS sufferers worldwide will face a cure. P.S - I know at the beginning of this post I said a lots happened, I'll get to that next time. Wow you have been through it, you obviously did the right thing going to A and E and hopefully now they may get to grips with the HS. I don't know much about it but will look it up. I have a couple of ilnesses that are not visible and I know howit feels when people don't understand. I think you are doing a great job and your son is a credit to you.I just wanted to say you are not alone out there.